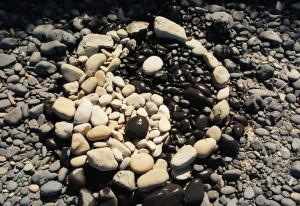 TaKeTiNa, (pronounced Tah Keh Tee Nah) is a unique and powerful meditative process of connecting with our innate rhythmic foundations to promote greater presence, resilience, flow and trust in our complex lives. All experience levels are welcomed and there is no technique to learn as we access basic rhythm elements with the voice, steps and claps. Using the body as the instrument allows the rhythm connection to be direct and deep. In each rhythm journey, we are slowly guided into a specific and increasingly complex multi-layered rhythmic form. We are encouraged to connect with the layers of rhythm at our own pace, and explore moving freely in and out of the rhythm. By welcoming flexibility and humor in our journey with the specific rhythmic form, we set-up a unique opportunity for efficient non-linear learning and discovery. Connecting to the complex rhythmic form is not something we can “make happen” or will ourselves to do. We must get out of our own way and allow ourselves to meet and fall into the rhythms in our own way and timing. 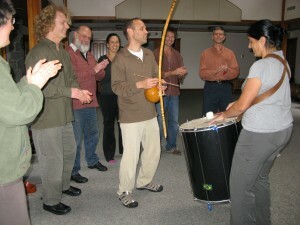 This falling into rhythm is encouraged by the facilitator through challenging and supportive rhythms. As the collective begins to welcome this process, we deepen our awareness of inner obstacles hindering flow and presence, and the opportunity of moving beyond these obstacles. As the rhythmic stability and relaxation deepen, we can open to the stillness within movement and the nourishing support of the collective groove. TaKeTiNa was developed by Austrian musician, composer, percussionist and master facilitator Reinhard Flatischler. As a certified advanced TaKeTiNa Teacher, Dave Chiller has completed two intensive trainings with Reinhard Flatishler and Cornelia Jecklin. More info can be found at What is Ta Ke Ti Na.